ASC Computers offers the best in business computer support in Sutton Coldfield. Whatever your business type all commercial ventures rely heavily on their computers. Enabling effective communications with customers through informational or direct sales on a company website, to effective ongoing communication with both suppliers and customers through business email. Any problems or failures with these vital system can see an immediate detrimental effect on your business and may even result in lost customers and loss of company reputation if not addressed quickly. – by creating a centralised store for all your important business documents, standard letters to customers, invoices, product information etc you allow your employees to save time by always having access to whichever files they need without the problems associated with having multiple copies of the same document on many different computers or laptops. This also allows easier collaboration on projects as files can be simultaneously worked on by different employees without the need to be sending documents back and forth over email or being repeatedly printed out which is another cost saving. – Once you have a central store for your documents and important business information this makes backing up that information much simpler. Backups can be programmed to happen on a regular basis and can be stored on and offsite for complete peace of mind that the information your business relies on is safe. – Keeping your computers operating system up to date with the latests updates and security patches is vital to ensuring the security and reliability of your computer system. Any problems here often result in either lost working time due to virus infections or time and money being spent to repair computer problems that could have been easily avoided. Once a centralised update system has been installed all of the computer updates can be programmed to happen automatically, outside of your normal business hours to prevent any loss of working time. – Anti virus is essential to keep your computers safe and running well. Most of our customers normally have a separate antivirus or internet security suite installed on each computer or laptop for which they have normally paid an annual subscription to someone like AVG, Norton or Mcaffee. The problem with a system like this in a business environment is that all the control is in the hands of each individual employee and any security suite is only as good as the person controlling it. If you have a number of computers which have active antivirus subscriptions which all end at different times there is then a requirement for someone to monitor which computers need their security software renewed on which date and you then risk being unprotected if someone forgets to renew a service when it is due. A centralised system can transfer the control of the software back to management by automatically programming updates, virus scans and other services such as internet page blocking or monitoring to ensure employee’s are focused on their work and are not accessing unauthorised websites. 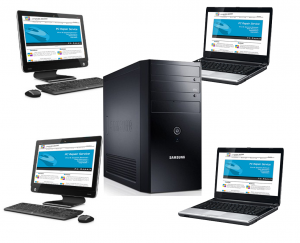 – Once you move to a more centralised computing setup adding more computers or laptops, or replacing older machines, becomes much easier and cheaper. – Many companies are now taking advantage of increased internet speed to allow employees to work from home or out on the road. We can set up secure encrypted connections so that you or your employees can access their important files and programs while out of the office, increasing productivity dramatically. Keeping all of your data on site also keeps it under your control preventing sensitive documents being copied onto removable media such as USB drives or CD’s which could then be lost or stolen. Working on a remote workspace allows you to keep all of your information secure whilst allowing employees to access whatever they need from a time and place to suit your business needs. – When we do go into a business to asses their requirements the one thing that would almost always yeild more benefit in terms of productivity than any other improvement is staff training. Consider the difference in time it takes for someone who is more proficient in computing to perform a task compared to a beginner and multiply this by the number of times in a working week that person may need to perform that task, the cost savings for your business could be huge. To find out more about out computer training services just contact us to discuss your requirements.